Templestowe Heights Primary School’s vision is ‘inspiring learners for life’. We value the importance of continual growth as learners for all members of our community; students, staff, parents and guardians. All staff have a shared goal of wanting to make a positive difference (social, emotional and academic) to every child under their care. Our vision is supported by our mission statement “the quality of the programs we offer will never be better than the quality of the teachers that deliver them”. Our mission is to provide opportunities for teachers to continually develop their skills, knowledge and understandings to enable them to provide high quality learning opportunities and learning experiences for all students at Templestowe Heights Primary. Templestowe Heights Primary School’s objective is to be the school of choice for the local community. We aspire to provide an inclusive and collaborative learning environment for all students, staff and families that promotes high expectations for lifelong learners, embracing and contributing to local and global communities. Our three pillars undermine the decision making process at Templestowe Heights Primary. First and foremost, the heart of every decision is centred on the benefits to every child. Secondly, the decisions we make are backed by empirical research (there are a lot of untried educational fads) and lastly, we continually generate evidence (data) to ensure the initiatives and programs implemented at the school are yielding positive results. We develop learning experiences focused on meeting the diverse needs of every child. Our curriculum is aligned to the achievement standards of the Victorian Curriculum’s 8 Learning Areas and 4 Capabilities. We have a non-negotiable curriculum of 10 hours of literacy (reading, writing and speaking & listening) and 5 hours of numeracy each week. Each term we explore a whole-school concept using an Inquiry Thinking approach, where we investigate and question big ideas that integrate all learning areas and capabilities (inquiry concepts include Change, Social Justice, and Identity). In addition, all students participate in our specialist program, where they have a separate teacher for Physical Education, Italian, Visual Arts and Performing Arts (music and drama). Through our newly developed STEM curriculum (Science, Technology, Engineering and Mathematics), all students now learn coding and apply their skills in our whole-school robotics program. All students now learn to design and create using our 3D printers. Our extra-curricular lunch time program caters for student-interests, are inclusive and free. Each term our dedicated teachers run these lunch time activities to offer students with an opportunity to try or further their interests in structured activities. These include robotics, Lego, choir, remote control cars, gardening, AusLan (sign language), yoga, dance, cooking and chess. Our assessment schedule is appropriately paced throughout the school year, allowing teachers to continually identify each child’s learning point of need. 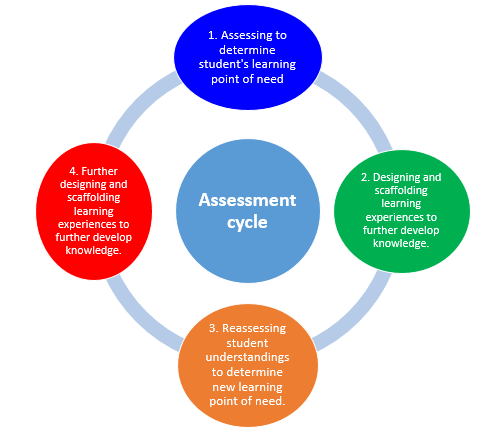 Our assessment approach follows the work of Patrick Griffin (2014) and Helen Timperley’s (2009) inquiry cycle. This allows us to scaffold learning experiences to support the individual needs of every child. We measure learning achievement against continuums of learning that informs us of where to next for each child’s learning goal. Our focus of creating personalised learning is supported by using the ongoing information gathered from assessment that monitors and measures learning achievement, and to set learning goals for our students. We have established a teaching and learning model that ensures no matter what class your child is in, there is a consistent approach. Our teaching and learning model is based on the gradual release of responsibility (Frey & Fisher, 2006), the diagram below displays what the teacher’s role and expectations (the left hand side) as well as the learner (right hand side) are during a lesson. Teachers at Templestowe Heights Primary are supported by instructional coaches to further develop their teaching practice with a goal of delivering high quality lessons. We use high impact teaching strategies that have been demonstrated by research to yield strong learning achievement outcomes (Hattie, 2009, 2012 and Marzano 2007).